Data Logger or a Temperature Monitor? A thermal data logger is an intuitive instrument designed to collate data sets regarding the temperature conditions of a process over time. This differs from a temperature monitor, which is designed for ongoing thermal monitoring and process control. Typically, a temperature monitor will not internally store data points, but there is some overlap between the two in terms of applicability and functionality. This blog post will explore the applications appropriate for using data loggers or temperature monitors in more detail. Both thermal data loggers and temperature monitors rely on thermocouple sensory inputs to directly acquire the thermal values of a component or a sample under test. These consist of wired metal junctions that are integrated into laboratory equipment such as heating chambers or mantles. The outstanding thermal conductivity of the alloy wires enables the propagation of heat across a broad temperature range, which is then converted into an electrical signal by the data logger or the temperature monitor. Typically, this information is then displayed on a simple user interface for real-time thermal monitoring. 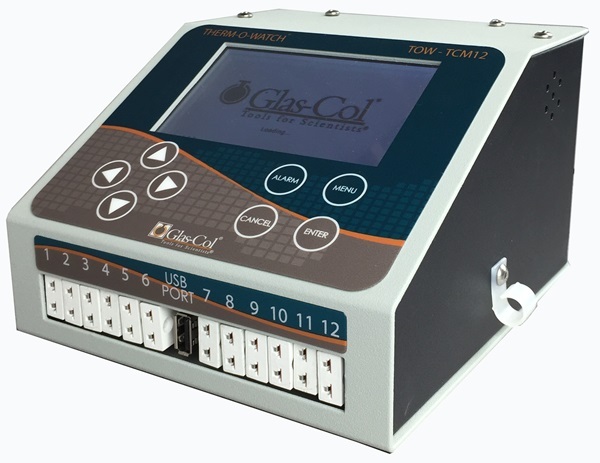 The 12 Channel Data Logger from Glas-Col supports continuous process monitoring with a full-color LCD display, providing easy viewing of twelve separate sensory channels. Our digital logging thermometer also features a legible display with simplified controls and an intuitive hold function that temporarily locks temperature readings on screens to support manual data logging. The primary similarity between a thermal data logger and a temperature monitor is the method of data acquisition. In terms of capacity, functionality, device footprint, and applicability, the two differ significantly. A thermal data logger is typically used for more demanding, higher throughput process monitoring with separate thermocouple channels for up to twelve distinct measurements simultaneously. Glas-Col’s 12 Channel Data Logger can continuously monitor and collect complex data points across each of these channels, with automatic internal storage to eliminate the likelihood of human error. It is fully functional with the three leading thermocouple types available from Glas-Col, with potential temperature readings ranging from -200°C – 1372°C (-328°F – 2502°F). The temperature monitors available from Glas-Col do not boast the automated capabilities of the data logger and are incapable of collecting data across such a broad selection of sensory inputs. The digital logging thermometer can operate with almost universal thermocouple input, however, with a low footprint design suitable for portable process monitoring and temperature readings in the field. The 12 Channel Data Logger is ideally suited for high throughput laboratory applications, while our temperature monitors are preferential for manual process monitoring where multiple readings or automated dataset collection is not required. Glas-Col provides a range of thermal monitoring equipment that can supplement either of these measurement techniques. If you would like to learn more, read our blog post on Thermocouples for Temperature Critical Laboratory Applications. Or, contact us directly if you have any specific questions about our products.